A quick message for NFL coaches who have to game-plan for the Patriots and try to figure out their tendencies: Good luck. Most NFL teams talk about “forming an identity” — figuring out the handful of schemes, plays, and concepts they do well on each side, and eliminating the ones that don’t suit their personnel. But the Patriots’ only identity is versatility and unpredictability. They have the personnel on both sides to morph into whatever scheme or concept they want, based on the matchup. 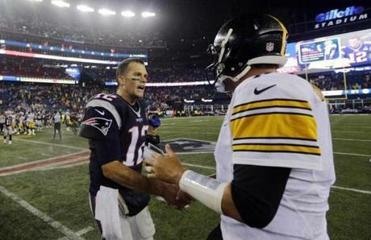 Aaron Rodgers and Ben Roethlisberger are in the top tier with Brady. But the Patriots signal caller has reached a new level of Zen. Jaworski calls the Patriots a “chameleon offense” because of their adaptability. They displayed it last year in the playoffs, when they threw 50 times each in wins over the Ravens and Seahawks and rushed 40 times for 177 yards against the Colts. But the Patriots have taken it to a new level this year, with running back Dion Lewis proving to be especially dangerous catching the football, and with four tight ends who can block and catch — Rob Gronkowski, Scott Chandler, Michael Hoomanawanui, and newcomer Michael Williams. The Patriots can go big, with two-, three-, and four-tight end sets and LeGarrette Blount pounding the football. They can go quick and small with Julian Edelman, Danny Amendola, and Lewis catching short passes. They can throw the ball out of heavy formations and run the ball out of passing formations. Defensively, it’s the same. They played a 4-3 base defense against the Steelers, and switched to a 3-4 against the Bills to try to stop the run. Their zone blitzes can be devastating, as Jamie Collins, Dont’a Hightower, Rob Ninkovich, Jabaal Sheard, and Chandler Jones have the skills to rush the passer or drop into coverage on a given play. They can play press-man coverage, drop into a Cover-3, or use a “Big Nickel” package to combat both the pass and the run. Every team in the NFL strives to have that versatility, but it’s much easier in theory than in practice. The Patriots are the rare team that can pull it off because they’ve had so much stability — Tom Brady has worked with Belichick for his entire career, and has thrown to Gronkowski and Julian Edelman for six-plus years. The core of the Patriots’ defense – Collins, Hightower, Ninkovich, and Devin McCourty — has grown together over several years. Jaworski was asked how many teams other than the Patriots are so versatile with their offensive game plans each week. And not only do the Patriots mix things up so well, they’re not afraid to fly against convention, either. Playing three rookie offensive linemen against Buffalo, which has arguably the best defensive line and pass rush in the NFL, most teams would bring in an extra lineman for help, or keep the running back in the backfield for protection. Not the Patriots. They ran out of an empty backfield on 24 of 86 snaps and had Brady drop back to pass 61 times. The result was 40 points and 507 total yards, and a relatively clean day for Brady, who was hit just five times. Jaworski was blown away by the amount of empty-backfield formations the Patriots used against the Bills, and through two games. Jaworski, who breaks down the coaches’ tape of every game at the NFL Films offices each week, said Brady has thrown more than twice as many passes out of an empty backfield than any other quarterback — completing 25 of 31 passes for 361 yards (13 of 17 for 166 yards with an empty backfield and two tight ends). The quarterback with the second-most attempts out of an empty formation is Tony Romo, who is 11 of 15. The brilliance of the game plan came in utilizing Lewis, Gronkowski, and Chandler as wide receivers. The Patriots got the Bills in their base personnel — using linebackers to cover those players instead of defensive backs — and took advantage of the slower defenders. If a team decides to match up with smaller, quicker personnel, the Patriots will simply adjust and pound the ball with Blount and the running game. The Patriots’ coaches will present the upcoming game plan on Wednesday morning when the players return from their day off. Some of the Patriots’ defenders watch film on their own on Monday and Tuesday, and text each other with their thoughts on the upcoming opponent and try to predict the game plan. Sometimes, it’s obvious. Many other times, the coaches will come up with something different. On the offensive side, players don’t even try to predict what McDaniels and his staff will come up with each week. The Patriots’ coaches also deserve credit for teaching the different concepts and game plans each week. As Bradley said, it’s a “precision league,” and the Patriots are the rare team that doesn’t suffer a performance drop-off when switching formations and personnel groupings. And, of course, Brady is a coach on the field, constantly putting teammates in the right situations. “It’s one thing for Josh McDaniels to sit in the room during the week and put together this intricate game plan,” Gannon said. “But if Aaron Dobson or David Andrews can’t handle it, then what good is it? Part of the credit goes to their staff and how they train their players to do multiple things. The Jaguars, Sunday’s opponents, are at the opposite end of the spectrum. They are limited on offense by Bortles’s youth and inexperience. And on defense, what you see is what you get — they line up in a 4-3, don’t blitz too often, and play mostly Cover-3 zone. Gannon thinks he has a fairly good idea what the Patriots will try to accomplish. Of course, the Patriots know that you know that. Take your predictions to the bank at your own peril.